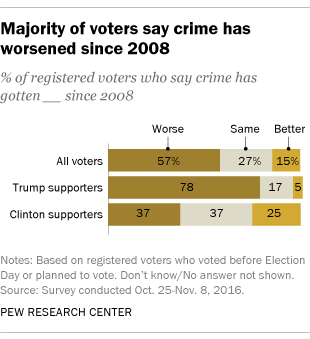 Despite double-digit percentage decreases in U.S. violent and property crime rates since 2008, most voters say crime has gotten worse during that span, according to a new Pew Research Center survey. The disconnect is nothing new, though: Americans’ perceptions of crime are often at odds with the data. Another Justice Department agency, the Bureau of Justice Statistics, produces its own annual crime report, based on a survey of more than 90,000 households that counts crimes that aren’t reported to police in addition to those that are. BJS data show that violent crime and property crime rates fell 26% and 22%, respectively, between 2008 and 2015 (again, the most recent year available). 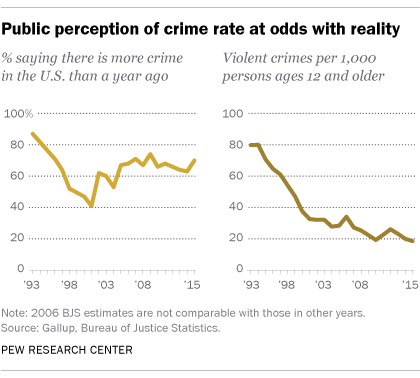 So what explains the gap between perceptions of crime and the data? For one thing, official government crime statistics lag behind the times. The FBI and BJS didn’t publish their crime reports for 2015 until fall of this year, meaning they don’t capture recent changes in crime. But perhaps the best context for understanding the conflict between voters’ perceptions of crime and the data is that voters are usually more likely to say crime is up than down, regardless of what official statistics show. These polling trends stand in sharp contrast to the long-term crime trends reported by the FBI and BJS. Both agencies have documented big decreases in violent and property crime rates since the early 1990s, when U.S. crime rates reached their peak. The BJS data, for instance, show that violent and property crime levels in 2015 were 77% and 69% below their 1993 levels, respectively.